Book: The Flexitarian Diet | relishments HAS MOVED! 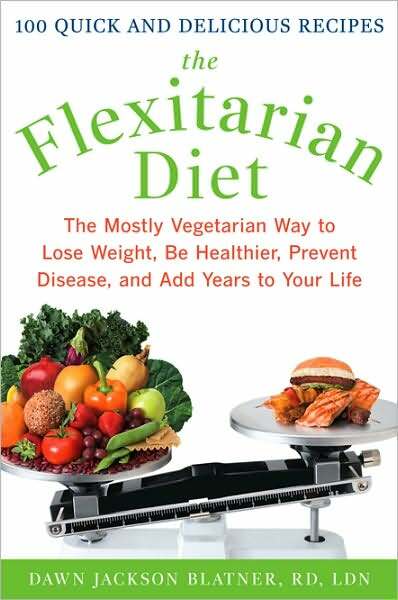 It took me longer than it should’ve (I need to work on making reading a priority), but I finally finished reading The Flexitarian Diet: The Mostly Vegetarian Way to Lose Weight, Be Healthier, Prevent Disease and Add Years to Your Life by Dawn Jackson Blatner. It was certainly one of the most educational books I’ve read on my venture towards eating better. The book’s goal is to educate ordinary people (such as myself) about easy ways to eat less meat and be healthier. It contained tons of helpful information, such as the number of various types of nuts in an ounce (eating 1 oz of nuts five days a week has been shown to lower the risk of heart disease by 30%, p. 30), a good list of umami foods (p. 32), a list of what fruits and vegetables are available during each season (p. 38) and a chart of grain cooking times (p. 44). Surely this information can be found elsewhere, but its wonderful to have it explained clearly in one book. The Flexitarian Diet also contains 100 recipes. Now, if we’re being honest, some of the recipes aren’t “recipes” as much as they’re guidelines for what is healthy eating, but I appreciated being reminded of healthy, simple snacks such as baked pita chips and peanut butter on celery, and the actual recipes are appetizing and simple. I would add, however, that the two recipes I have made from the book resulted in much more food than expected (each recipe is supposed to make 1 serving). Double (or more) the recipes with caution, or you’ll end up with more food than you may want. All the information was a bit overwhelming at times and I had to remind myself that it’s acceptable to make one or two changes to my diet at a time. It’s not necessary to do everything Blatner recommends overnight. One of the most important lifestyle changes I made immediately was trying to only eat grains with “whole wheat” as the first ingredient (processed grains lack 25% of the grain’s protein and 15 of the key nutrients, p. 43). This is not a cookbook for foodies, but if you’re a new flexitarian (or vegetarian) its a great resource for eating nutritiously and cooking simply. I found it very useful in trying to make meat-free meals that have high nutritional value. Entry filed under: books. Tags: books, flexitarian. i’ve contemplated buying this book. i’m trying to subscribe to a healthier lifestyle. but every book on food i’ve come across is such a snooze! i’m glad you liked this, maybe i will check it out!